It is amusing to hear all the ‘are the Patriots going to go 13-3?’ talk after Monday night’s pounding of the lowly Chiefs considering how dire the situation looked just a few weeks ago. Don’t get me wrong, achieving a 13-3 or a 12-4 record is an amazing feat regardless of how it is achieved and it would be hypocritical to say otherwise. However, after being burned in recent years by a 16-0 and a 14-2 season, fans have been quite loudly yearning for playoff victories and getting their hands one more time on a Lombardi trophy before Belichick and Brady’s glorious careers finally sunset. So with this in mind, can the cupcake schedule of facing Colts, Broncos, Redskins, Dolphins and the imploding Bills really prepare the Patriots for a playoff run? Everyone is well aware of how beat-up the Patriots defense is and how they rank dead last in yards allowed, but fewer people are openly discussing the Patriots offensive woes. The Tom Brady-led high-powered machine, surgically cuts up opposing teams and usually has to wave off claims of whether running up the score is unsportsmanlike or not. Win time of possession battle by continuously converting third downs. Tom Brady, like every other mortal, is much less accurate when he doesn’t get a chance to set his feet. 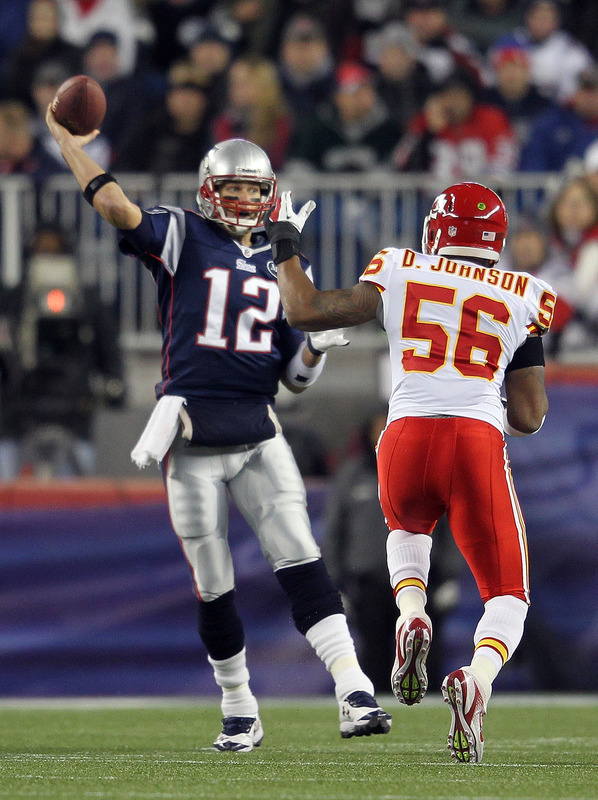 The pressure also disrupts an already average rushing attack, forcing Brady to make the perfect pass every time. Obviously, this is much easier said than done, and can only really be accomplished with an amazing defensive line. However, some of the teams that the Patriots will have to face in the playoffs can execute the above stated game plan.New Englandwas bounce three times in recent history with just such a game plan. This year the losses to the Steelers and Giants were eerily reminiscent of the Patriots past January woes. So how is playing some of the worst teams in football going to help the Patriots get ready for the post-season? Sure, they will be able to get healthy without losing ground in the standings, and their confidence and momentum will be high, which shouldn’t be understated. However, achieving a 13-3 or 12-4 record without facing a playoff team after Thanksgiving should give pundits and fans pause. Therefore, we should not overlook the Eagles just because they are 4-6. They just beat a good Giants team and have a great defense when they’re not shooting themselves in the foot. For the Patriots sake, I hope that the Eagles don’t implode and are able to give the Patriots their last real test before the playoffs start. Couple things about cupcakes – they allow you to rest if necessary and they allow you to practice and get your timing and communication down. They also give you confidence (real or imagined). Also – how many times have you (or me) looked forward to a game against an opponent with a great record who ‘hasn’t played anybody yet’ only to get beat? Happens all the time. I’m not going to pause every week after a victory and try to convince myself that the Pats still can’t do it in the post-season. I’m going to take each game for what it is and wait for the actual post-season test. After all, last year’s 14-2 team passed all the ‘tests’ that were thrown at them (Indy, Pittsburgh, GB, Bal) and still spit the bit v. the Jets. So – there ARE no guarantees either way, IMHO. I agree that trap games are a real problem and I for one am very worried about the Eagles. Confidence, healthy starters and getting a teams timing down as well a playoff bye and homefield advantage are all keys to a successful Super Bowl Run. I was just cautioning fans to not equate 13-3 to greatness. It’s a mystery why the Pats have an average running attack. They have the highest paid guard in the league, a monstrous rookie who’s learning the ropes quickly, another huge second-year guy, a great free-agent pickup, two rookie running backs with fresh legs and a guy who ran for over 1,000 yards rushing last year. If Dante is one of the best O-line coaches in the league, why can’t he get these guys to run block? I must have a different perspective on this than most in the media, it’s becoming very obvious. YES… the playoffs are more important. WAY more important. But why don’t we let the regular season play out, with a schedule they can’t control, against QB’s & defenses they didn’t choose, and see what happens? When they end up 12-4 or 13-3 with a top-2 seed, then we can wonder about the playoffs. I don’t look at last year and say ‘boy they had a 1 seed, went 14-2 and lost in the first round’… I say ‘They lost to the Jets in the first round.’ Whether they were 11-5 or 14-2 is of no consequence when it comes to that outcome. They played well in the regular season and put themselves in a great position. BUT… Then they blew it. We get it. What does 14-2 really have to do with it? This idea that we can learn NOTHING from the last 5 weeks is utterly ridiculous. We can watch them try to work on their plan, watch certain match-ups they might similarly face in the postseason, guys who have little exprience can get some, we can scoreboard watch and see if the top seed can be had, etc. Then, when they face their first playoff opponent, we can fret over whether or not this team can prove they are January-ready. Until then we have no clue, so enjoy it. Finally, what I think might be missing most around here is perspective. Have you watched the competition? ALL of them (Steelers, Ravens in particular) have flaws. You can make a case the Steelers should have lost last night to the Palko-lead Chiefs. They didn’t, but you could easily make the case. Same team smoked by the Pats 6 days earlier. The Ravens beat a good team on Thursday, but Flacco is clearly not great and while their D is good, they faced Alex Smith, not Tom Brady. I don’t know what will happen in January, but I am hoping they win every game the rest of the way, put themselves in a good position again and this time rise up to the challenge. Until then, enjoy a good football team that most football fans in America would kill for. For them, we are the 1%. Ooops…did I just come out as a ‘fanboy’. Dammit! I also agree that we should enjoy every game for what it is. “Take it one game at a time” is the Patriots Motto and its a good one. I was commenting on the notion that BECAUSE we are 13-3 that makes us a great team. I think those 2 things can sometimes be unrelated. So we should enjoy the games but not extrapolate too much into the playoffs, because you never know what will happen. Like today, my boy Adams got released. Believe me, I was railing more on the mainstream Boston Sports mafia… err… media, not you. Fine with them having an opinion, but they act like everything is already decided (i.e Bobby Valentine will fail) or that nothing can happen now that is worth anything (unless it’s negative) until we hit the playoffs. It’s ludicrous. I just hate the extremes. You are either dillusional to think there is anything to be gained by the last 5 weeks…. or you have to think that we must dismiss anything we see until January.